Although the connection between the invention of printing and the Protestant Reformation of the sixteenth century has long been a scholarly commonplace, there is still a great deal of evidence about the relationship to be presented and analysed. This collection of authoritative reviews by distinguished historians deals with the role of the book in the spread of the Reformation all over the continent, identifying common European experiences and local peculiarities. It summarises important recent work on the topic from every major European country, introducing English-speakers to much important and previously inaccessible research. 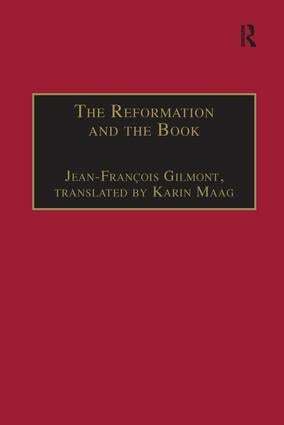 Contents: Introduction, Jean-FranÃ§ois Gilmont; Printing at the dawn of the 16th century, Jean-FranÃ§ois Gilmont, The book in Reformation Germany, John L. Flood; French-speaking regions, 1520-62, Francis M. Higman; Printing and the Reformation in the Low Countries, 1520-c.1555, Andrew G. Johnson; Three border cities: Antwerp, Strasbourg and Basle, Jean-FranÃ§ois Gilmont; Printing and the Reformation in Antwerp, A.G. Johnston and Jean-FranÃ§ois Gilmont; Reformation printing in Strasbourg, 1519-60, Miriam U. Chrisman; Printing and the Basle Reformation, 1517-65, Peter G. Bietenholz; Books and the English Reformation prior to 1558, David M. Loades; Printing and Reformation ideas in Spain, A. Gordon Kinder; The book and the Reformation in Italy, Ugo Rozzi and Silvana Seidel Menchi; The book and the beginnings of the Reformation in Hungary, Gedeon Borsa; The book and the Reformation in Bohemia and Moravia, Mirjam BohatcovÃ¡; The book and the Reformation in Poland, Alodia Kawecka-Gryczowa and Janusz Tazbir; The book and the Reformation in Denmark and Norway, 1523-40, Anne Riising; The book and the Reformation in the Kingdom of Sweden, Remi Kick; Conclusion, Jean-FranÃ§ois Gilmont; Index.